Abstract. Understanding the sources and evolution of aerosols is crucial for constraining the impacts that aerosols have on a global scale. An unanswered question in atmospheric science is the source and evolution of the Antarctic aerosol population. Previous work over the continent has primarily utilized low temporal resolution aerosol filters to answer questions about the chemical composition of Antarctic aerosols. 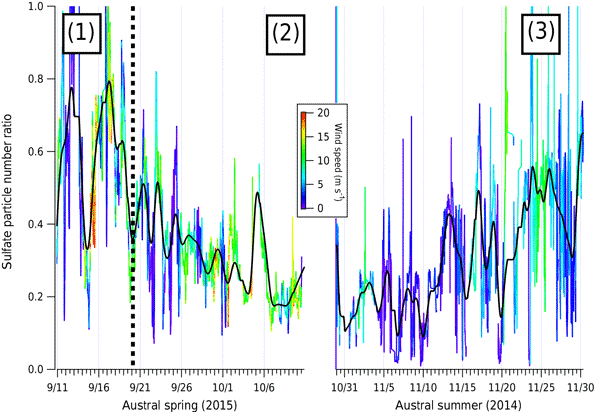 Bulk aerosol sampling has been useful in identifying seasonal cycles in the aerosol populations, especially in populations that have been attributed to Southern Ocean phytoplankton emissions. However, real-time, high-resolution chemical composition data are necessary to identify the mechanisms and exact timing of changes in the Antarctic aerosol. The recent 2ODIAC (2-Season Ozone Depletion and Interaction with Aerosols Campaign) field campaign saw the first ever deployment of a real-time, high-resolution aerosol mass spectrometer (SP-AMS – soot particle aerosol mass spectrometer – or AMS) to the continent. Data obtained from the AMS, and a suite of other aerosol, gas-phase, and meteorological instruments, are presented here. 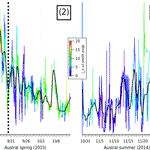 In particular, this paper focuses on the aerosol population over coastal Antarctica and the evolution of that population in austral spring. Results indicate that there exists a sulfate mode in Antarctica that is externally mixed with a mass mode vacuum aerodynamic diameter of 250nm. Springtime increases in sulfate aerosol are observed and attributed to biogenic sources, in agreement with previous research identifying phytoplankton activity as the source of the aerosol. Furthermore, the total Antarctic aerosol population is shown to undergo three distinct phases during the winter to summer transition. The first phase is dominated by highly aged sulfate particles comprising the majority of the aerosol mass at low wind speed. The second phase, previously unidentified, is the generation of a sub-250nm aerosol population of unknown composition. The second phase appears as a transitional phase during the extended polar sunrise. The third phase is marked by an increased importance of biogenically derived sulfate to the total aerosol population (photolysis of dimethyl sulfate and methanesulfonic acid (DMS and MSA)). The increased importance of MSA is identified both through the direct, real-time measurement of aerosol MSA and through the use of positive matrix factorization on the sulfur-containing ions in the high-resolution mass-spectral data. Given the importance of sub-250nm particles, the aforementioned second phase suggests that early austral spring is the season where new particle formation mechanisms are likely to have the largest contribution to the aerosol population in Antarctica. How to cite: Giordano, M. R., Kalnajs, L. E., Avery, A., Goetz, J. D., Davis, S. M., and DeCarlo, P. F.: A missing source of aerosols in Antarctica – beyond long-range transport, phytoplankton, and photochemistry, Atmos. Chem. Phys., 17, 1-20, https://doi.org/10.5194/acp-17-1-2017, 2017. This paper summarizes two field measurements of particles and gases made in coastal Antarctica and represents the first real-time composition measurements of particles in this understudied area of the world. Using the combined data from both field measurements, we find that there is a constant background of particles in coastal Antarctica and that they are mostly sulfate. Seasonal transitions from winter to spring add additional particles, and that from spring to summer adds additional sulfate.